B'jesus you don't have to be Irish to celebrate St Patrick's Day. Anybody in London on 17 March will get a fantastic welcome at the St Patrick's Day Parade and will be able to join in with all the fun along the route and in Trafalgar Square, although you might enjoy yourself more if you wear something green. The Paddy's Day Parade kicks off at the top of Piccadilly by Green Park (where else?) and continues down Lower Regent Street and Pall Mall before finishing up at Trafalgar Square. You will need to book a place in the Parade if you're not content to be a mere spectator and this can be done through the website. If you would rather watch than participate, keep your eyes open for the marching bands, floats, costumed characters and street theatre groups. However if you want to bring your family along you can just turn up in the morning (before the Parade starts) and join the family section. The fun continues in the Square with a food market, a children's area and an afternoon of laughs in the London Irish Comedy Festival Marquee. After all we can't guarantee a rain free day here, just as they can't in the Emerald Isle. Entertaining you under cover in the marquee will be Aisling Bea, Fred Cooke, Paddy Culligan, Jarleth Reagan and Ruby and Rory O'Hanlon. The food market will be selling Irish specialities such as Cashel Blue cheese, Keogh's crisps and Ballymaloe relish. Drink will also be available so that you can raise a toast to St Patrick himself. The children's area will include an arts and crafts workshop for making shamrock key rings and charm bracelets. If your kids want to let off steam there will be an opportunity for budding Riverdancers to practise some Irish dance steps as well as a chance to learn more about Irish sport and try out Gaelic football. 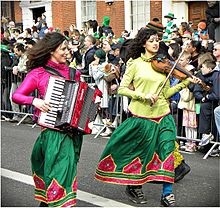 It's not necessary to go to Ireland to find the craic; it's here in London on 17 March. I'm really looking forward to this St Pat's day.